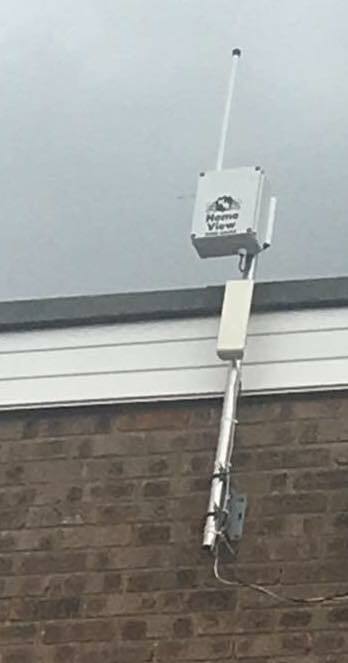 Not long after my last post on this subject, back in January, the preamp I had mounted in the box at the top of 30ft of pole strapped to the side of my house failed and I was forced to removed that particular ADS-B aircraft tracker. I still had my loft unit running and working very well with my home brew two element J-pole collinear. 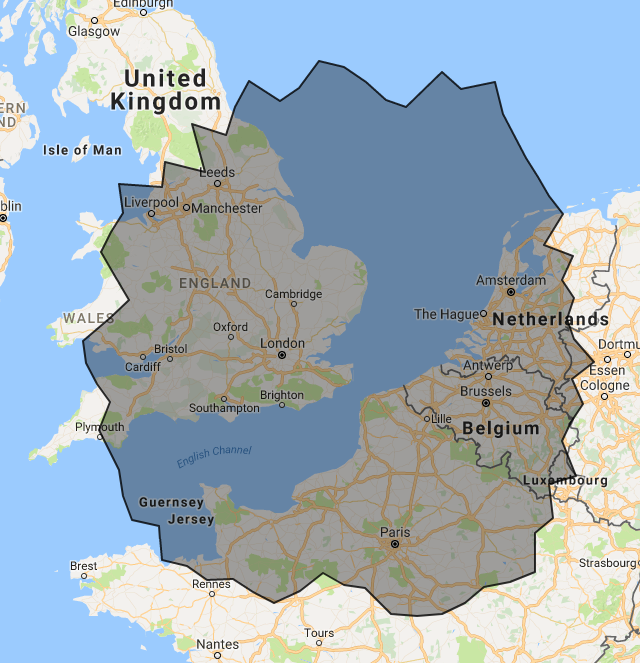 Tony, G0MBA and I have been talking about the things we can do with an ADS-B receiver – We considered mounting one at the Martello Tower Group site but unfortunately the required bandwidth to upload is far higher than our monthly allowance on the 4G dongle we use for GB7CL so we quickly abandoned that idea. That didn’t stop Tony from building a receiver in a box though and before very long, he’d assembled this and put it up at a site he has access to near his home. The problem was that it didn’t work anywhere near as well as was expected and after some investigation, we realised that it was because he was using an older version SDR dongle with no preamp or filtering. By this time I’d replaced my Uputronics preamp with the upgraded version containing the ceramic filter so we did a deal which meant he’d get the preamp/filter and I’d have a new receiver in a box. Two weeks later and I’ve got the receiver here and in the air. 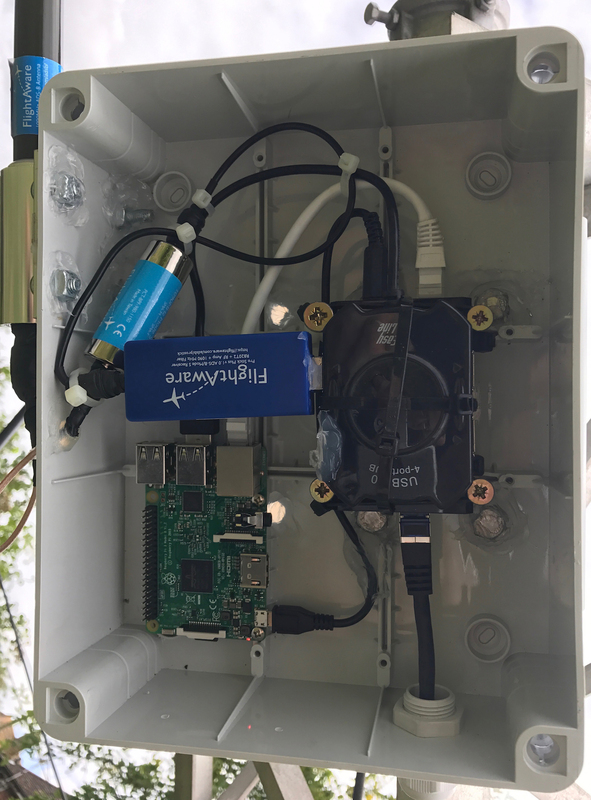 I’m using a Raspberry Pi to run the software which uploads to Flight Aware, Flight Radar24 and PlaneFinder. The receiver is a Flight Aware Pro Stick Plus dongle and I also added an additional Flight Aware 1090 MHz bandpass filter as well. It’s being fed with a length of CAT6 cable with Power over Ethernet. I chose to do this so that I’d have the absolute minimum signal loss in the coax and of course, network cable is significantly cheaper than coaxial cable. I’m using the Flight Aware 26″ vertical. Tony built this all for me without the filter so I had to make some tweaks inside. It’s not as neat and tidy as when I got it but the important thing is that it all fits and works. Some readers may have noticed that the receiver already has a built in bandpass filter and wonder why I felt the need to add an external one. 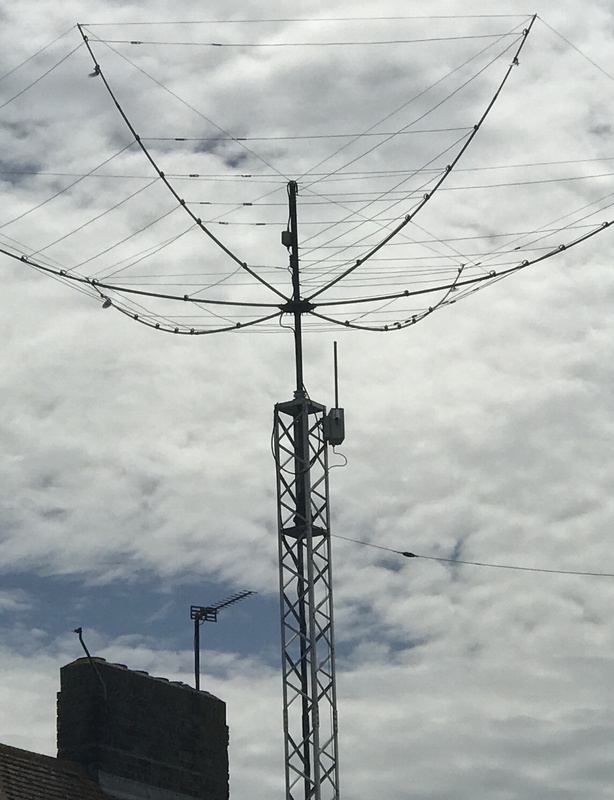 The reason is quite straightforward – With a relatively high gain aerial up in the clear, with no feeder loss, it’s quite common to overload the front end of these receivers and for them to be swamped by external signals. I knew I’d have plenty of gain so I decided that it wouldn’t be a problem to add a little insertion loss through the filter and I’d get the benefits of additional filtering. I did test the bandpass filter with my miniVNA Tiny and was pleasantly surprised by the results. 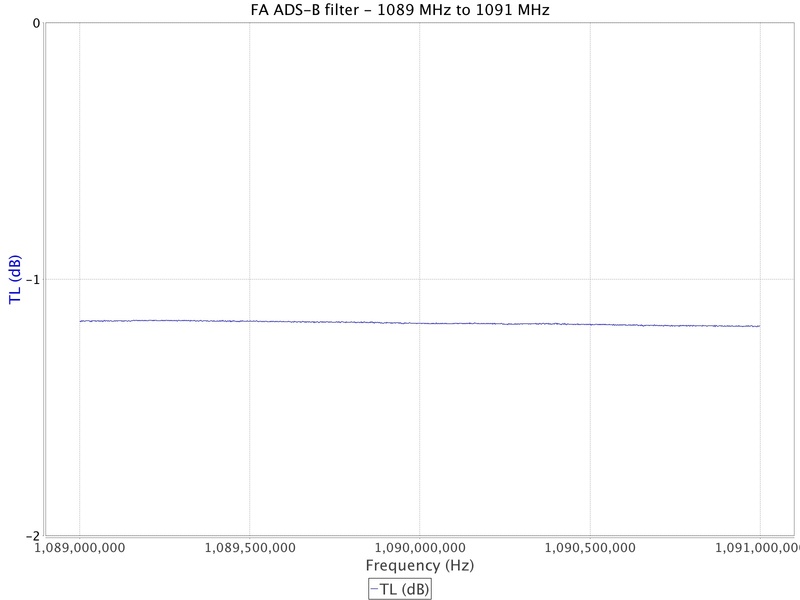 I was expecting the insertion loss to be around 3dB but in fact it measured around 1.15dB on 1090 MHz. Far better than anticipated. The main reason for a filter is to attenuate out of band signals and this seems good. 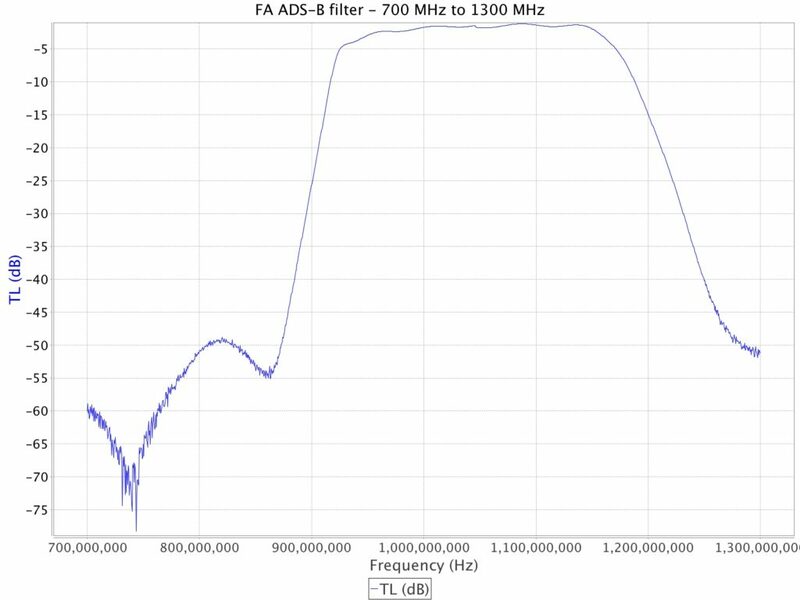 The actual bandpass part was wider than I expected but it still provides decent attenuation at cellphone frequencies as you can see. The important thing is the performance – How well does it work compared to my indoor receiver? The answer is ‘significantly better’. I’m receiving around 25% more position reports and 4% more aircraft using the external receiver. This might seem odd as the number of aircraft isn’t that much higher but there are a finite number of birds up there and if I’m already receiving signals from most of them, then it’s just not possible to hear that many more. The position reports is the important figure because it indicates that I’m receiving more transmissions from the existing aircraft. One thing I was concerned about was the risk of interference when I’m transmitting using my Hexbeam. I’ve separated the network cable and the coax as much as possible and I deliberately chose shielded CAT6 network cable. I’m happy to report that even running maximum power, I don’t appear to cause any problems with the ADS-B receiver. I upload the data I receive to FlightRadar24, FlightAware and PlaneFinder. 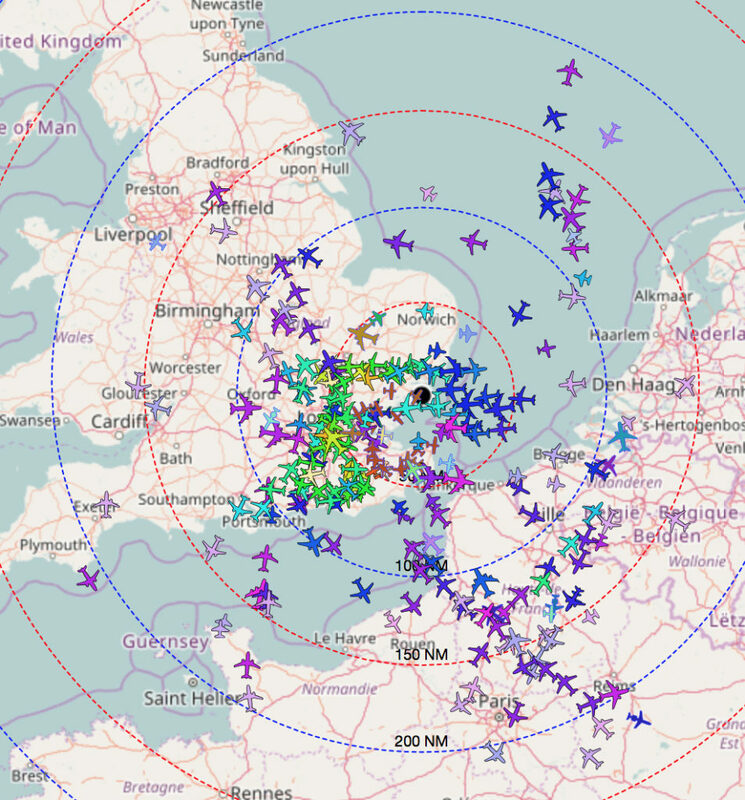 The reason for using PlaneFinder is because it generates a rather nice heatmap of where I’m receiving traffic from. Earlier this week I captured this image which shows me tracking over 375 aircraft. It’s working incredibly well which really isn’t too surprising. It’s high, it’s in the clear and it has an almost unobstructed view to the horizon in all directions. This is a setup I’m very satisfied with. Not really, that aerial is for 2.4 and 5GHz so won’t be very effective on the ADS-B frequency of 1090MHz.